I love breakfast. I’d venture to say it’s my favorite meal of the day. It’s rare, however, that we go out for breakfast and it’s just as rare for me to make something special here. 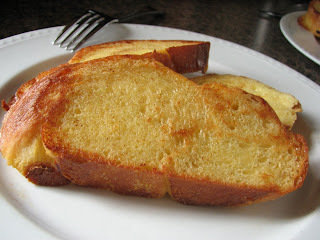 A few weeks ago I made challah knowing that we probably wouldn’t eat much of the bread and hoping that I’d be motivated to use the stale loaf for french toast. After it sat on the counter staring at me for a few days, I did just that! 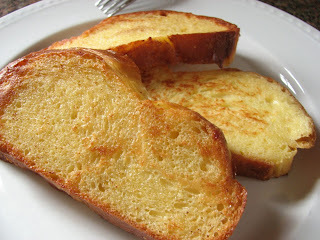 I knew I wanted to try this french toast recipe from Alton Brown as I’d watched the episode of Good Eats where he made it and it looked delicious! I was skeptical as I made it. When the bread went into the oven after being browned on the stove it was still fairly soggy and I was sure I’d somehow screwed up this simple recipe. Fortunately, that wasn’t the case as it came out of the oven golden and beautiful. It smelled so good! Shane and I both loved this recipe and it was definitely worth the time it took to put together!